Of all the freeways in the U.S., the most productive corridor for self-driving trucks appears to be Interstate 5 through Washington and Oregon, says a report released this week by the Kirkland-based INRIX data company. Runners-up are I-95 from Jacksonville to Miami, Florida; I-75 from Valdosta, Georgia, to Miami; I-70 from Utah to Kansas, and I-85 from northeast Georgia to Greensboro, North Carolina, where companies could reduce the cost to move freight once self-driving vehicle technologies are ready. 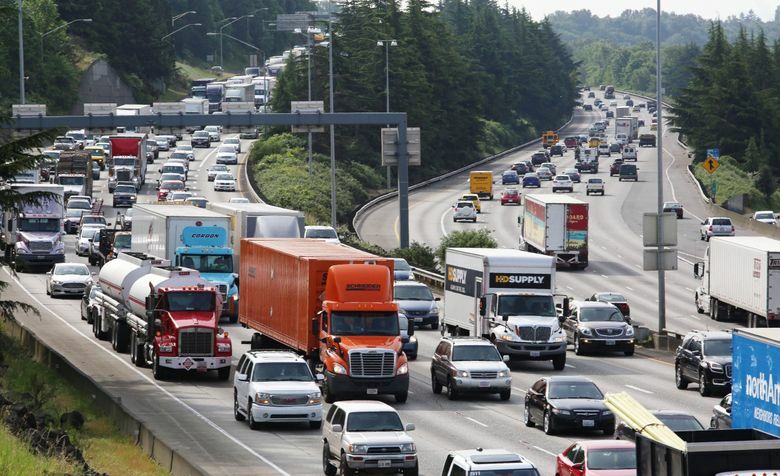 Second, the highway is less congested than several other U.S. freeways on a 24-hour basis to operate trucks — despite INRIX’s own assertion this spring that Everett experiences the nation’s worst peak-time highway delays. Congestion eases throughout southern Washington and southern Oregon for interstate trips. I-5 in Washington and Oregon ranked first nationally in a study by traffic-research company INRIX of the best corridors to operate self-driving semitrucks. INRIX chose its criteria based on a future business model where an autonomous truck powered by electric batteries or diesel-hybrid motors would cross long highway miles and then be taken over by people who would pilot the rigs through crowded cities to the final loading dock or port, said Avery Ash, INRIX’s autonomous vehicle director. Trucking companies report a national shortage of commercial long-haul drivers, Ash said. “The benefits supplied by labor cost savings will likely exceed the capital costs associated with alternative drive trains,” the report said. 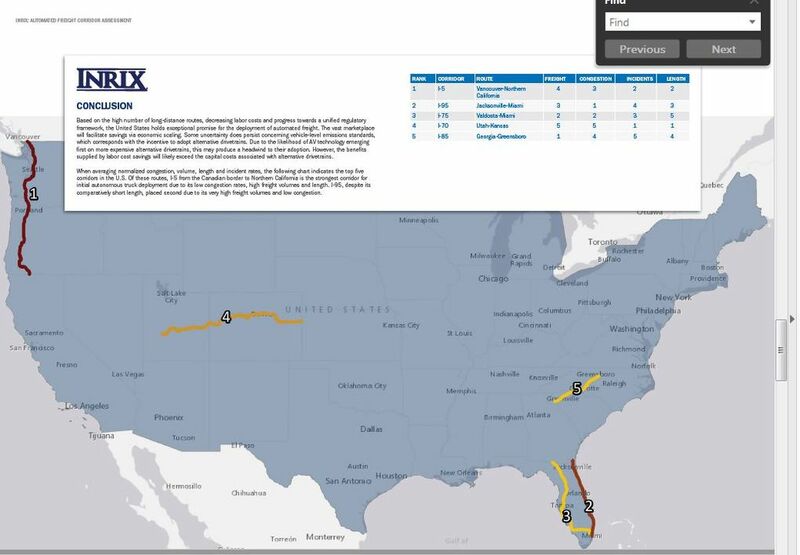 INRIX ran a separate analysis of safety data, finding that autonomous trucks have the highest potential to avoid collisions on some of the nation’s most crash-prone highways, such as I-75 from Chattanooga, Tennessee, to Atlanta; I-45 from Houston to Dallas; I-20 from Dallas to Shreveport, Louisiana. ; I-95 and I-295 in Philadelphia, and I-95 from New York City to Providence, Rhode Island. Meanwhile, an investigative report by The Kansas City Star faults the National Highway Traffic Safety Administration and the trucking industry for dragging their feet on available technologies to prevent rear-end crashes in which heavy trucks kill 300 people a year. Many new automobiles offer automatic braking when an obstacle is detected, while railroads are launching new positive train control systems that can automatically stop a train. However, Ash said the decision to move to fully autonomous trucks is driven mainly by economics, and is a much different choice than whether to install new automated braking systems now for safety’s sake. INRIX says the study is meant to start a conversation, in which trucking operators and states use its data to inform choices about future routes, Burfeind said.